Research on the history of archaeology in Mesoamerica has had a long period of development, and interest in the topic is increasing. There are several historiographic stages in this sequence, and they illustrate how the writing and use of the history of archaeology has changed. The tendency to review and evaluate past archaeological works has been a part of archaeology in Mexico and Middle America almost from the beginning. In the mid-nineteenth century, many contributions bore such titles as “Recent Expedition to …” which described the work of pio­neer explorers. 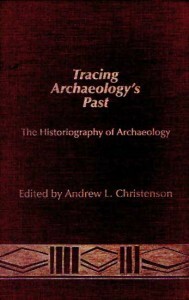 Between 1900 and 1950, writings with such titles as “The Present State of Archaeology in …” and “Activities Performed during the Year …” appeared. All of these works were historic, even if they only revised recent history. The use of previous investigations, however, was not always the same. On the one hand, there were interpretations or criticisms with academic objectives, and on the other hand, there were works with the clear intention of writing history. In Mexico and Middle America, the first studies of the history of ar­chaeology appeared simultaneously with the positivist philosophy of the late nineteenth century. One pioneering work was “Reseña Histórica del Museo Nacional de México” by Jesús Sánchez (1877); others include Enrique de Olavarría y Ferrari’s (1901) Sociedad Mexicana de Geografía y Estadística; Manuel F. Alvarez’s (1901) work on Mitla; and the continentwide histories of Manuel Larrainzar (1875-1878), Marquis de Nadaillac (1883), and Hu­bert H. Bancroft (1886). The period ended with the series of still-unpublished volumes by Manuel Martínez Gracida (n.d.a, n.d.b), written between 1885 and 1910, in which he presented all available information on the ruins of Mitla. By 1911 in Mexico, a new stage in writing about archaeology’s past and another way of viewing general anthropology had begun with Ramón Mena’s article (1911), “La Ciencia Arqueológica en México desde la Procla­mación de la Independencia Hasta Nuestros Días” and later with the studies of Luis Castillo Ledón (1924) on the first 100 years of the National Museum. Also active at this time were Juan Bautista Iguíñiz (1912), Enrique Juan Pa­lacios (1930-1931), Paul Schelhass (1935), Henri Cordier (1920), René Verneau (1920), and Paul Rivet (1920). These writings were often apologetic, rescuing ideas that supported those of the historian. Others tended to neu­tralize or attack other Iines of thought considered old-fashioned, anachro­nistic, or simply unscientific. Slowly and by process of selection, history spotlighted some archaeologists and cast others into oblivion. Archaeology underwent profound transformations, leading to major reinterpretations of what had been done in the past. In most cases, historians sustained aca­demic or institutionally derived positions and rejected parad igms that were not their own. An exception to this general approach was that of Samuel Lothrop (1926), a forerunner of the more modern methodology of the fol­lowing period, who wrote about the first objects from Palenque to arrive in Europe. The next period, 1945 to 1975, includes Ricardo Castañeda Pagani­ni’s (1946) Las Ruinas de Palenque, which demonstrates the changes imple­mented then. With modern, qualified judgment, he thoroughly examined the colonial writings about the site. He paid little attention to inaccuracies written by the first travelers but emphasized their efforts to expose the world to so many discoveries. Although this work was not the first of this type, difficult, systematic research was required to locate the necessary docu­ments, some of which were being published in Spain without the author’s knowledge (Angulo Iñíguez 1933-1939). The bibliography of the history of archaeology increased greatly at this time, the articles of other times were now books, and the Iines of work had diversified. One such Iine highlighted special personalities or groups: examples include Daniel Rubín de la Borbolla and Pedro Rojas’s (1956) controversial work on archaeology in Honduras; Hugo Cerezo Dardón (1957) on the discovery of Tikal; discussions of Juan Galindo’s work by William Griffin (1960) and lan Graham (1963); Manuel Ballesteros Gaibrois (1960) on the Palenque discovery; David Pendergast (1967) on the Walker – Caddy expedition to Palenque; Justino Fernández’s biography of Father Már­quez (Fernandez and Marquez 1972); and Elizabeth Carmichael’s (1973) discussions about English archaeologists in Central America. In a series of articles, Ignacio Bernal, the most prolífic writer of the time, covered a vari­ety of issues on the history of archaeology in Middle America (Bernal 1952, 1953, 1961, 1962; Schávelzon 1983c). A simultaneous Iine of research fo­cused on ways of thinking, as in Robert Wauchope’s (1962) study of the “lunatic fringe” of mesoamerican archaeology. Characterized by systematic rescue and reinterpretation of past archaeologicaI work, the period had a notable feature: authors left aside acid criticisms of former archaeological method. The work of pioneers was no longer used as a comparison to praise modern techniques or theories. At the end of the period carne Willey and Sabloff’s (1974) History of American Archaeology, which was the first full-scale history of New World archaeol­ogy and carne at a time when several regional histories were published. Internal approaches, that is, the way nationals viewed work in their own countries, became common. One question was, are conditions the same for nationals and for foreigners doing archaeology in the same country? Begin­ning in the 1960s, national identity became a central problem in Latin America. Several works tried to explore the archaeological situation: Igna­cio Bernal (1979) in Mexico; Luis Luján Muñoz (1972) in Guatemala; and Luis Casasola (1975) in El Salvador. Beginning around 1975, the institutionalization of mesoamerican history of archaeology allowed it to be included in the world history of ar­chaeology. Glyn Daniel’s Short History of Archaeology (1981c) contains an extended section on Latin America. Also symptomatic of this period was the First Congress on the History of Mesoamerican Archaeology held in Mexico in 1983 in honor of Ignacio Bernal (Schávelzon and Litvak 1983). The trans­lation into Spanish and the commercial publication of the much-criticized work of Brian Fagan (1984b) on the Aztecs and the outstanding historio­graphic study of the same culture by Benjamin Keen (1984) are examples of increased interest in this kind of publication. In the last decade a variety of books on the history of “classic” per­sonalities, for example John L Stephens and Frederick Catherwood (Hagen 1974), and of others not as well known, for example Lord Kingsborough and his contemporaries (Graham 1977), have been written. Robert Brun­house published much biographical material, including books on early trav­elers, antiquarians, and pioneer archaeologists (1975) and on Frans Blom (1976), which followed an earlier book on Sylvanus Morley (1971). The period has also resulted in works by Keith Davis (1981), who viewed Désiré Charnay as explorer and photographer; Augusto Molina (1978), who wrote about Palenque; and Lawrence Desmond, who wrote about the Le Plon­geons (Desmond 1983; see also chapter 12), and many others. the emergente of the model of Maya ceremonial centers, by Bernd Beyer (1986) on those of Oaxaca, and by myself on archaeological restorations (Schávelzon 1984) and the work at Zaculeu (Schávelzon 1988). There are other notable changes taking place in the writing of the history of mesoamerican archaeology, and although it is always difficult to understand processes that are current, one notes the absence of interest in some determinant issues. My intention is not to criticize the selection that history always implies, not even the methodological arbitrariness this selection represents. But different lines of historiographic acceptance or rejection are apparent. For instante, archaeologists work not only in the field and in the laboratory but also are involved in many other activities that are part of their professional lives: teaching; searching for financial support; dealing with institutional struggles and personal confrontations; defending ideas; participating in the sacred ritual of congresses, lectures, and seminars; find­ing editors; maintaining relationships with their colleagues; or even avoiding important political issues that could interfere with their work in a foreign country. The list is endless and, in general, our histories often leave such topics untouched. We fail to examine national, institutional, or personal struggles and controversies except when they have to do with different par­adigms or interpretations supported by scientists (see chapter 14). A few examples of these subsidiary matters help clarify my point. When the Peabody Museum of Harvard University undertook fieldwork at the ruins of Copán between 1891 and 1899, a heated controversy arose in Honduras. In short, the excellent scientific work performed was viewed po­litically; opposite points of view were taken by the liberal and conservative governments. Foreign archaeologists were tied closely to the dramatic eco­nomic problems created by American corporations. As a consequence of the Copán archaeological work, some authorities and ministers were re­moved, scandals occurred, and contracta were more than once cancelled. At the same time, these foreign archaeologists left the country in possession of rich archaeological collections —with the government’s authorization, it is true— creating a situation of diplomatic and economic pressures. The events can be interpreted in different ways; certainly the people of Honduras and the American museums have very different views. These issues clearly had more significante than the archaeological works themselves. As another example, when in 1923 the Carnegie Institution initiated work in Mexico, the situation was quite different. The authorization to ex­cavate Chichén Itzá was mainly political. A committee that had been dis­cussing the possibility of reinstating diplomatic relations between Mexico and the United States made the decision to allow excavations to commence as a cultural approach to facilitate negotiations. As a part of this strategy, the School for Foreign Students was then created at the National Autonomous University of Mexico (UNAM), where Ramón Mena dictated his lessons on Mexican archaeology in English to American students who made the trip to Mexico free of charge. It was also in this framework that Byron Cummings from the University of Arizona began his excavations at Cuicuilco (Scháv­elzon 1983a, 1983b). There are no doubts about the capabilities of Sylvanus Morley and his staff, but their work took place in a special context. Chichén Itzá was in the middle of the most restless region of Yucatán, just pacified alter the War of Castes and led by communist Felipe Carrillo Puerto, who wanted to de­clare Yucatán a republic independent of the central Mexican government. The significance of Chichén Itzá was obviously different for Carrillo Puerto than for the Carnegie Institution or even for the Mexican government (Scháv­elzon 1984). Again, archaeology had different meanings to the different groups involved. Another case involves the endless confrontations between Edward Thompson and the Mexican government between 1890 and 1915. Thomp­son, anamateúr archaeologist and consul for the United States in the Maya region, played for American historiography the part of a pioneer, a man of courage who had to overcome difficulties common in those times and in that land (e.g. Echánove Trujillo 1975; Fagan 1977). But in Mexico he is considered a looter, someone who unmercifully destroyed archaeological cites and exploited the Maya Indians. His name is usually recalled when Mexicans want to refer to some lunatic exercising political and intellectual power. In his official activity he was consul and representative of the Amerí­can corporation that controlled the monocultives on which the lives of thou­sands of Maya Indians depended. The Carnegie Institution even had to pay Thompson to work at Chichén Itzá, as he remained the legal owner of the ruin for another 30 years, until he was tried and destituted and the ares nationalized. It does not matter who was right or wrong, but it is important to understand that confrontations such as these are examples of greater con­flict in the cultural field and that recognizing this wider context is necessary for the historian of archaeology. The examples aboye were chosen at random -they seemed to me to be representative and have been prominent in the literature. Modern studies of the history of mesoamerican archaeology increasingly concentrate on conflict and paradigmatic change instead of on processes and evolution. Conflicts, among paradigms, personal positions, and institutional positions, are often more determinant of scientific change than periodic processes of growth. Also, the quality of ideas has not been as important as the academic or economic power of the scholars involved. Archaeology is subject to different meanings and objectives in each country of the North American continent, and these meanings and objec­tives change continually. Archaeology for an aboriginal, ethnic, or popular group is not the same as for scholars with their academic and learned view­point. Thus, the history of archaeology varíes depending upon which side of the road the historian stands. Mesoamerica has more than 400 million individuals, with a sophisticated cultural legacy, and their search for an identity is closely linked to archaeology and ethnology. The recent publi­cations in the history of mesoamerican archaeology are beginning to rec­ognize the social and political context of archaeology, and we can expect it to be a major trend of future research.